Understanding the anatomy of whitetail deer is valuable information that every hunter must have to make a quick and clean harvest. It is our duty as sportsmen to do everything in our power to make and ethical kill. If you subscribe to that line of thinking, then you hold shot placement at a premium. The most ethical placements are generous leaving the shooter room for error while still targeting the vitals. Arrow angles must be considered for every shot from tree stand but even more important is the body position of the deer. NEVER free your arrow on a deer quartering toward you. Doing so increases the chances of wounding the deer and decreases your chances of a successful harvest. Be patient! Take broadside and quartering away shots. These shots are more forgiving and give you a greater chance of hitting the vitals. Experienced archery hunters need to share their shot placement knowledge on to beginners. Those of us who learned the hard way and have tracked monster bucks for miles and miles are the best messengers in delivering this important lesson on shot placement. There are many things you can do to maximize your practice sessions to guarantee proper shot placement in the field. Flinging arrows at targets and 3D targets is a lot of fun but it does present the shooter with an authentic hunting scenario. Afterall, practicing shooting a target is not the same as practicing shooting a deer. Use your 3D target to consistently hit the vitals during your practice sessions. Be sure to shoot from different angles. Never shoot when a deer is quartering towards you. We aren’t discrediting target practice. Shooting targets in a field or yard is good for sighting in your bow and it will help develop repetition of proper shooting form, however, it does very little to prepare the shooter for an authentic experience. For that we must simulate a hunting situation. Shooters need to consider as many variables as possible when trying to create an authentic experience. Judging distance on the fly, shoot from different body positions, shooting fully outfitted in hunting attire, and shooting from a treestand are all variable that most hunters leave out of their practice routines. All of these things can ruin your chance at the trophy you have eyed all year. Practice judging distance on the fly. The majority of missed shots are a direct result of misjudged yardage. Shoot from random distances often. This will force you to estimate the shooting distance. You can always measure distance with a range finder after the shot. Many times during practice sessions I will hold distance judging contests with my fellow shooters without ever taking a shot. It amazing what a little competition will do to hone in your distance judging skills. When in my treestand I use a range finder to mark distances to specific objects and mentally estimate from those points of reference. Take a few sessions and shoot fully clothed from a treestand at a 3D target in the woods. Start practicing like you hunt. That means heading into the woods and setting up a blind or tree stand, depending on what you normally hunt from. 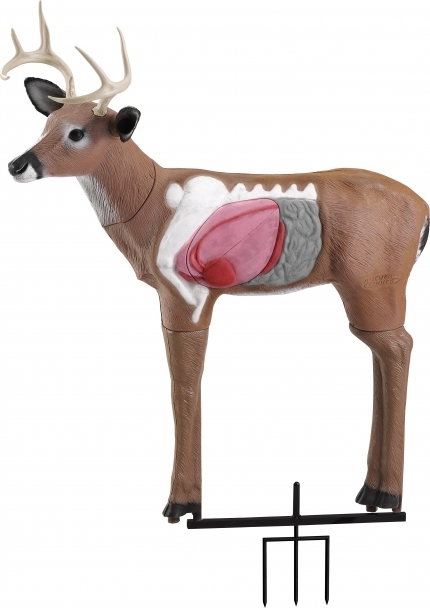 Place targets at random distances with various obstructions wear your hunting clothes and start shooting. This will help you detect any problems your clothing may present to shooting prior to a botched shot on an actual hunt in the field. Be sure to move the target to practice shots to the vitals from both broadside and quartering away positions. When taking a quartering away shot aim at 3D target’s far shoulder. A well placed shot targeting the far shoulder is the most effective and well placed bowhunting shot and will lead to an ethical kill with a short recovery. 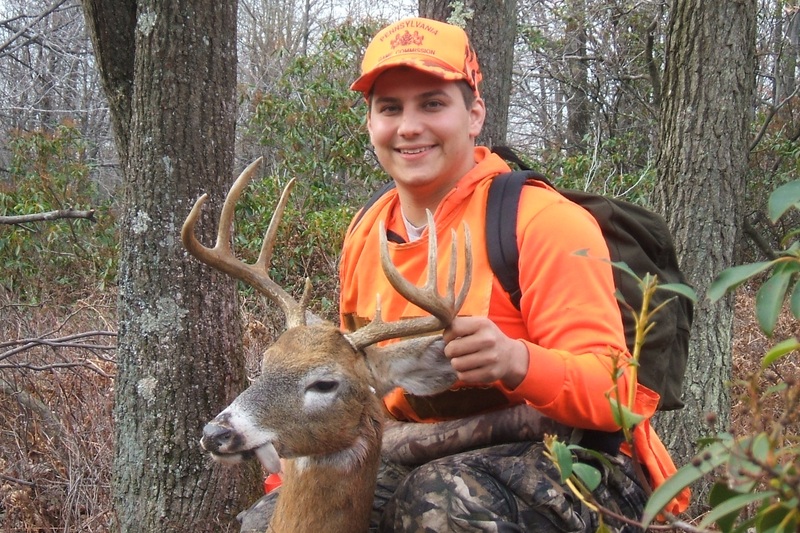 TSO Editor Andy Surra poses with this 9 point Pennsylvania buck. Practice authentic shooting scenarios to help you be more successful in the field. Master hitting the vitals in the field and we guarantee you will spend less time tracking and more time dragging. As always send your questions to teamsurra@gmail.com. Don’t forget to follow us on twitter @SurraOutdoors and “like” us on Facebook. When I watch hunting shows, I’m always amazed at where the arrow hits, since I know whitetail anatomy fairly well.